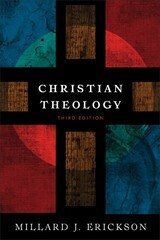 Christian Theology 3 Edition Leading evangelical scholar Millard Erickson offers a new edition of his bestselling textbook, now substantially updated and revised throughout. This edition takes into account feedback from professors and students and reflects current theological conversations, with added material on the atonement, justification, and divine foreknowledge. Erickson's comprehensive introduction is biblical, contemporary, moderate, and fair to various positions, and it applies doctrine to Christian life and ministry.